🎂 Axios is 2 years old today. Thank you for your interest and encouragement as we build America's next great company. I'm grateful to my talented Axios colleagues, who have made this a fun adventure as we change the world through Smart Brevity. President Trump was frustrated about leaks — specifically leaks attributed to "White House officials" — that were critical of him. Cliff Sims, a young White House communications aide who had bonded with Trump during the campaign, slipped through the private dining room and was ushered into the private study, just off the Oval Office. 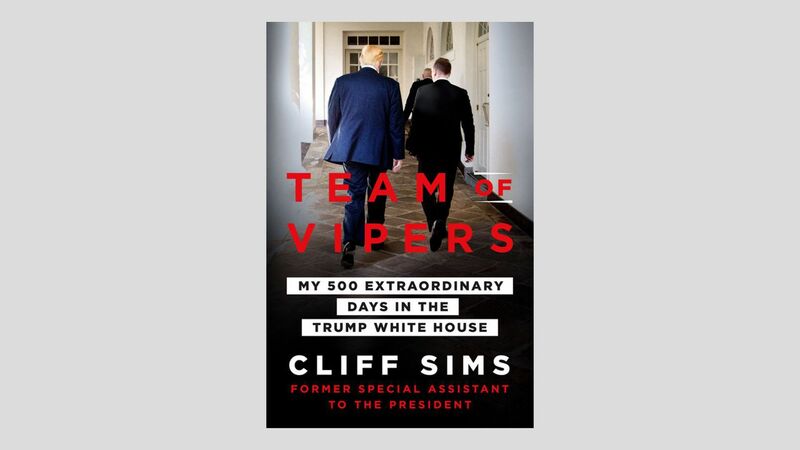 As recounted in Sims' memoir — "Team of Vipers: My 500 Extraordinary Days in the Trump White House," out Jan. 29 from Thomas Dunne Books — the minister's son from Alabama was soon sitting face to face with the man he still referred to as "DJT," in leftover campaign lingo. This was in 2017, when West Wing chaos was a constant storyline in the media. Trump and Sims, then 33, had talked on the phone the night before. Trump wanted to know who Sims thought was leaking, and said to come see him — but to come through the back, so the senior staff wouldn't know. Only in retrospect did I see how remarkable this was. I was sitting there with the President of the United States basically compiling an enemies list — but these enemies were within his own administration. If it had been a horror movie, this would have been the moment when everyone suddenly realizes the call is coming from inside the house. The President proceeded to name White House staffer after White House staffer. Almost no one was deemed beyond reproach—not his chief of staff, not senior aides, almost no one other than those with whom he shared a last name. He wanted me to help him judge their loyalty. How, I wondered, had it come to this? Trump took out one of the black Sharpies that he usually carries in his coat pocket. As Sims dished, Trump scrawled two lists on a stiff card with the White House seal at the top. One list was people he could trust. The other was people he couldn’t, and wanted to let go. The combined lists included about 15 people — 10 of them naughty, and five of them (all campaign alumni) nice. The card was later spotted in the president's breast pocket — a reminder of what he perceived as the enemies within. Sims portrays what he describes in his author's note as "the unvarnished Donald Trump, a man whose gifts and flaws are both larger than life, written by someone with an appreciation of both." "Lincoln famously had his Team of Rivals. Trump had his Team of Vipers." "We served. We fought. We brought our egos. We brought our personal agendas and vendettas. We were ruthless. And some of us, I assume, were good people." "This is what I saw. And, unlike the many leakers in the White House, I have put my name on it." Two years ago, the Women's March sparked a movement that propelled a record number of women into politics. 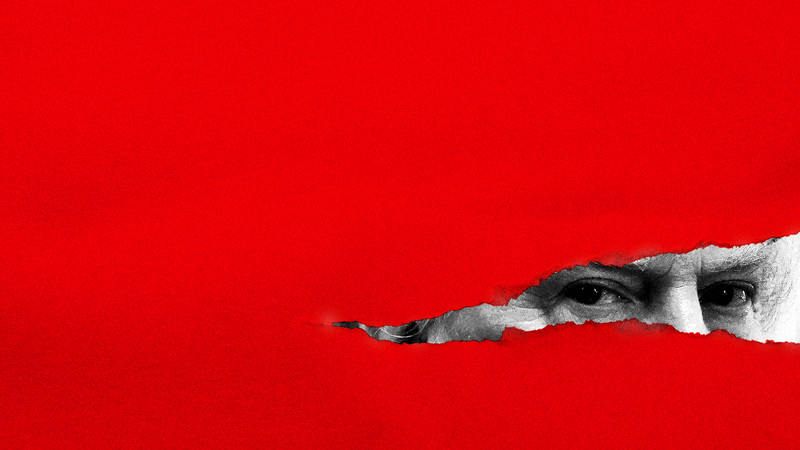 Ahead of tomorrow's march in D.C. and 280 other places around the country, it is fractured and so controversial that prominent Democratic women are steering clear, Axios' Caitlin Owens and Stef Kight report. Why it matters: Despite its early momentum, the march has become at best an afterthought and at worst politically toxic for elected officials and political organizations that once supported it. The big picture: Democrats still see women as key to their chances of claiming the White House in 2020. They largely credit the 2017 Women's March — which drew between 3.3 and 5.2 million people — as the spark that ignited the left's political backlash against President Trump and helped elect a record number of women to Congress in November. This year's march is the second planned by the Women's March organization. Last January's march was organized by local D.C. groups. What's new: Divisions in the Women's March leadership, including accusations of anti-Semitism and exclusion of the LGBTQ community, has shrunk support. The DNC, whose chair Tom Perez spoke at the first march, is not involved this year. EMILY's List, which helps get women elected to public office, is also not directly supporting this year's march, but is holding a training day after. "We are organizing under a big tent, and that big tent is always going to be a little messy inside because we've got a lot of people with a lot of history, a lot of priorities, a lot of trauma who are coming together in ways that have not been done before." It's a Catch-22 for Democratic candidates: Women voters are crucial for their 2020 prospects, and that the Women's March was a significant force in driving them to the polls. But the group's chaos and factions have made candidates reluctant to align themselves with this year's events. In 2017, Sens. Kirsten Gillibrand and Kamala Harris spoke at the D.C. march, and Speaker Nancy Pelosi and Sen. Amy Klobuchar attended. Sen. Elizabeth Warren spoke at the Boston march. 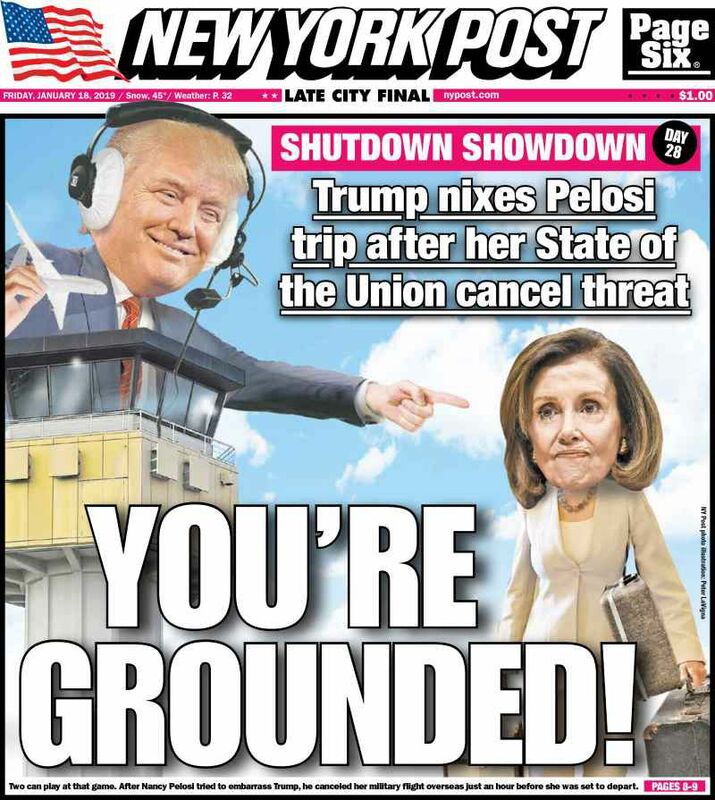 This year, Harris, Warren, Klobuchar (who said she'll be at a funeral), and Pelosi aren't attending. Gillibrand is speaking at the Iowa Women's March. Although she isn't attending, Harris told Axios: “I think that the Women’s March is an important place and a gathering and harnessing of energy that is about women empowerment." The bottom line: "Big social movements are always complicated and messy," Cecile Richards, former president of Planned Parenthood, who spoke at the 2017 march, told Axios. "That’s the history of social movements. I think what’s really important is that the takeaway from all this is that women aren’t going back." Axios managing editor Kim Hart and reporters Alexi McCammond and Alayna Treene contributed to this report. The report by BuzzFeed News' Jason Leopold and Anthony Cormier "cites two unnamed federal law enforcement officials who say Cohen acknowledged in interviews with [Mueller's office] that the president directed him to deceive Congress about key facts linking Trump to the proposed deal in Russia." "Democrats said that if the report is accurate, Trump must quickly be held to account for his role in the perjury, with some raising the specter of impeachment." From BuzzFeed: "Trump vehemently denied having any business interests in Russia. But behind the scenes, he was pushing the Moscow project, which he hoped could bring his company profits in excess of $300 million." "[T]wo law enforcement sources said he had at least 10 face-to-face meetings with Cohen about the deal during the campaign. "Trump ... supported a plan ... by Cohen ... to visit Russia during the presidential campaign, in order to personally meet ... Putin and jump-start the tower negotiations." "Make it happen," the sources said Trump told Cohen. Over the past year, The Boston Globe tracked down 93 of the 113 valedictorians who appeared in the paper’s "Faces of Excellence" features from 2005 to 2007. "1 in 4 failed to get a bachelor's degree within six years." "40% make less than $50,000." "Nearly a quarter aspired to be doctors ... but none has earned a medical degree." Four have been homeless: "[T]he Globe interviewed four who experienced homelessness after high school." "One, Madelyn Disla, became homeless not long after she graduated from Dartmouth College, done in by a combination of a new baby, lack of a job, and an extended family unable to provide a temporary bed." 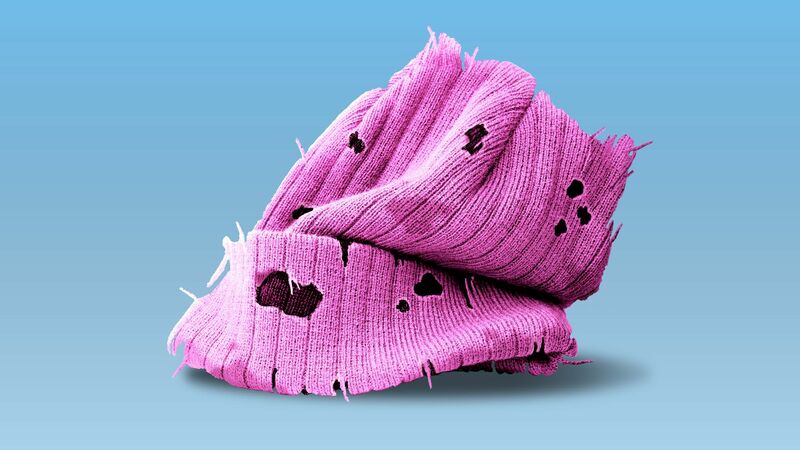 Why it matters: This represents a stunning "epidemic of untapped potential." "[M]any saw their opportunities begin to diminish soon after high school, perpetuating an epidemic of thwarted potential among young Bostonians." This is amazing: "Despite the many obstacles to success they encountered, Boston valedictorians themselves generally did not complain about their disadvantages." "The overwhelming majority said they were better off than their parents and nearly 9 out of 10 felt they had a 'fair shot.'" Read the first part. ... Fast read: 8 takeaways. "Others ... are hesitant to apply, knowing they will have to pay back the unemployment benefits when they finally return to work. 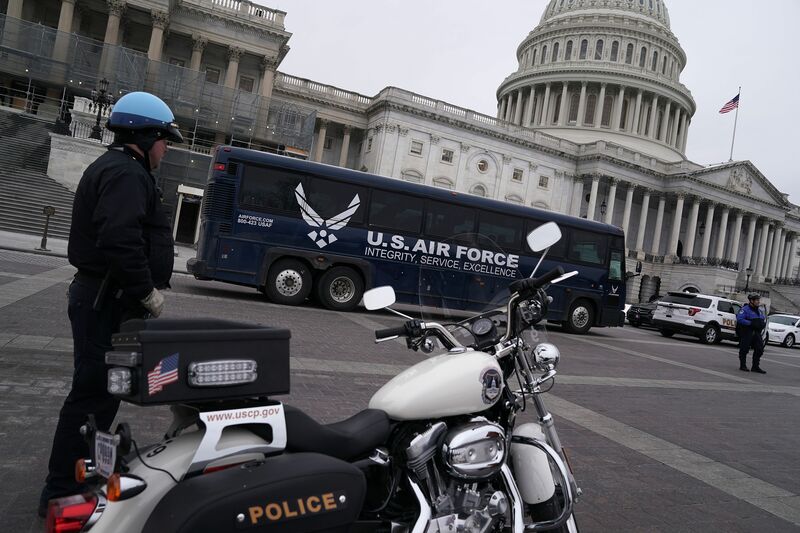 The Labor Department said yesterday "that the number of furloughed federal employees seeking unemployment benefits has jumped, from fewer than a thousand per week before the shutdown to more than 10,000 during the week that ended Jan. 5." "We had one lady offer an agent money. The agent said no, so she just dropped a $5 bill on the ground." The money was deposited in the lost-and-found bin. P.S. Senate Majority Leader Mitch McConnell op-ed in today's Washington Post, "H.R. 1 is really the Democrat Politician Protection Act." 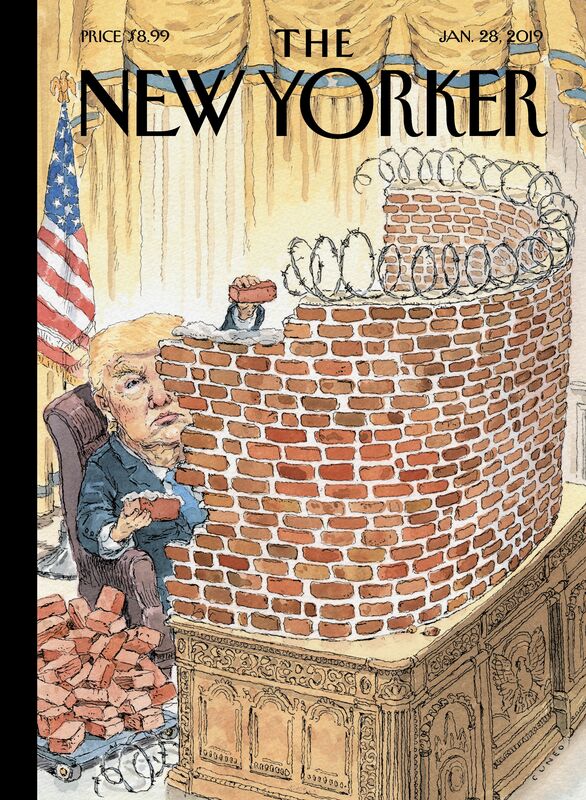 The cover of The New Yorker next week is "Walled In," by John Cuneo. 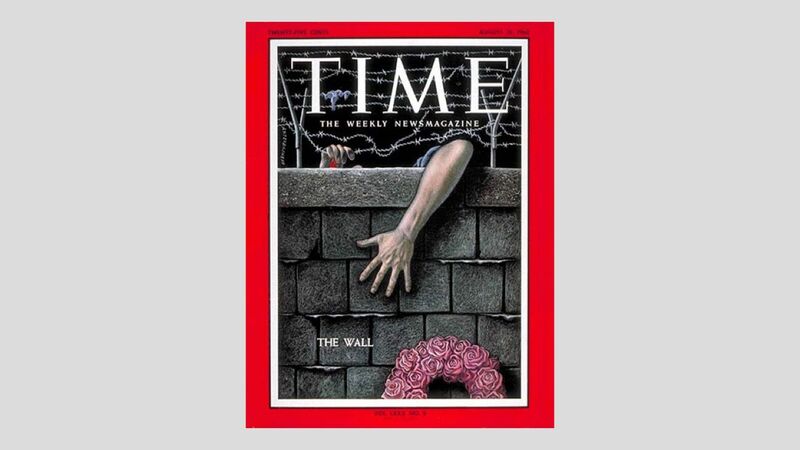 Cuneo’s image nods to a magazine cover from another era — a drawing about the Berlin Wall ("Wall of Shame," below) by Boris Artzybasheff for TIME of Aug. 31,1962. The New Yorker's "Cover Story" notes that Cuneo last year depicted the President enjoying a day of golfing in the swamp. “When it comes to drawing Trump, I’ve kind of hit the wall myself,” Cuneo said. “Half of a face is more than enough." HHS, "the agency tasked with caring for migrant children, did not adequately track them until after a judge ruled [June 26] that children must be reunited with their families," the government watchdog said. 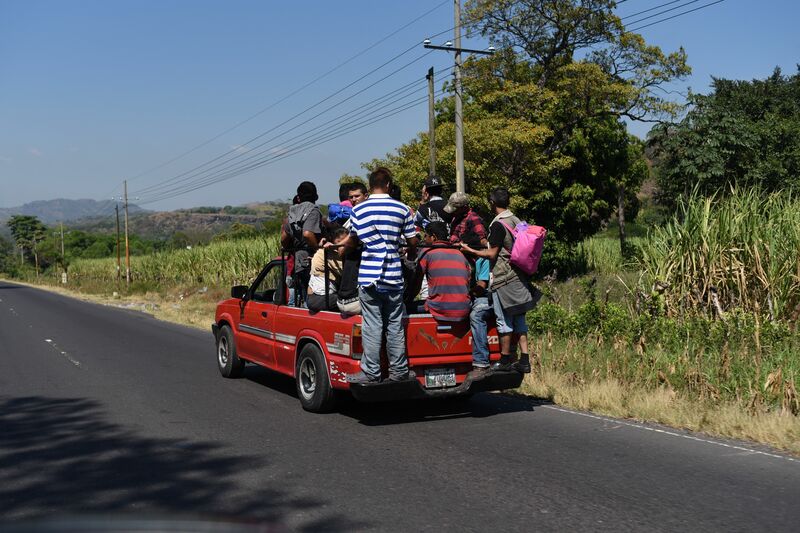 The "number of children removed from their parents was certainly larger than the 2,737 listed by the government in court documents." 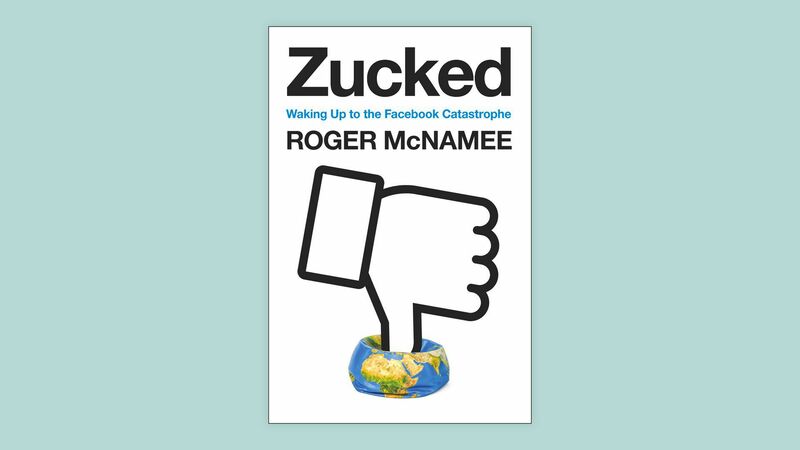 Facebook investor Roger McNamee uses a new book, "Zucked," out Feb. 5, to escalate his claims that the social network is bad for society, Axios' David McCabe writes. McNamee’s status as a one-time adviser to Facebook founder Mark Zuckerberg has made him one of the company’s most prominent critics. McNamee, now trying to bring regulatory attention to the company, writes: "The time has come to accept that in its current mode of operation, Facebook’s flaws outweigh its considerable benefits." Facebook is pushing back: "The reality is Roger McNamee hasn’t been involved with Facebook for a decade," said a spokesperson. Facebook's Jonny Thaw said: "We take criticism seriously. Over the past two years, we've fundamentally changed how we operate to better protect the safety and security of people using Facebook." McNamee is a longtime investor who founded his last firm, Elevation, with Bono as a partner; he says he still holds shares of Facebook. The book is excerpted as part of a cover package in the new TIME. Former Facebook board member and Washington Post publisher Donald Graham criticized McNamee in another TIME piece for not being critical of Facebook when things were good. The book’s seven pages of acknowledgments namecheck 15 Senate staffers and eight from the House, as well as a large swath of the media — from the makeup team at MSNBC to some of the outlets that broke the Cambridge Analytica story. McNamee will have a TV and national radio blitz in early February. "At least a half dozen declared or potential presidential candidates will attend events and talk about what King's legacy means to Americans in 2019." "Among them is former Vice President Joe Biden, who ... will make his first public appearance of the year at the National Action Network's annual King breakfast in Washington with its founder, the Rev. Al Sharpton, and Martin Luther King III." "The King holiday marks the first time in the early days of the Democratic primary that so many White House hopefuls are holding public events on the same day." Raising a glass to Axios' second anniversary ... A hot trend in restaurants: Smart Brevity for wine lists. "Last year, for the first time, the annual World of Fine Wine restaurant wine list awards included a category of 'micro' lists," Bloomberg's Elin McCoy writes. "They’re a worldwide phenomenon," says super-sommelier Rajat Parr, who recently designed a 75-item wine list for San Francisco’s just-opened Trailblazer Tavern, a Hawaiian comfort food haven. "Micro lists are less intimidating and easier to navigate." Master sommelier Matt Stamp of Napa’s Compline has a rule of thumb for what constitutes a "micro list": “It’s a list on one page, with type in a font I can read!" And all the people said: Amen!